Interstate 85 traverses a good portion of the Appalachian piedmont, as it provides a major travel corridor between the Deep South and Mid Atlantic Regions. 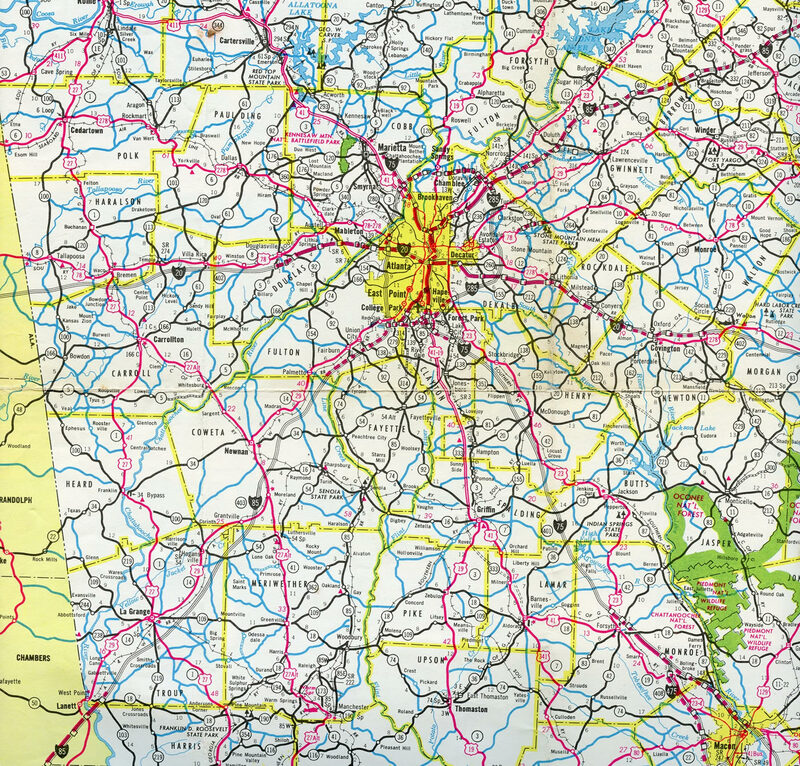 The increasingly busy trucking corridor connects the major metropolitan areas of Atlanta and Charlotte. 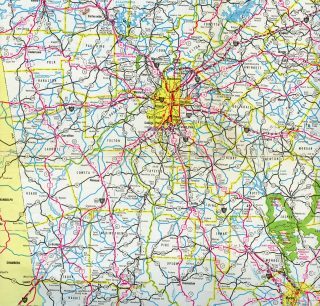 In addition, Interstate 85 links several smaller growing metropolitan areas including Greenville-Spartanburg, the Triad (Greensboro), and the Triangle (Durham). Both directions of Interstate 85 were closed north from the Brookwood Interchange (split with Interstate 75 / Downtown Connector) to Georgia 400 (Exit 86). GDOT indicated that the southbound span was compromised as well, requiring a full replacement.30 Northbound traffic was reopened on April 1 north from the I-75 split to Exit 86, where traffic shifted onto the adjacent Buford Spring Connector (Georgia 13). Georgia 13 parallels I-85 north to Georgia 400 and Sidney Marcus Boulevard, returning traffic to the Interstate 85 mainline via direct ramp ahead of Buford Highway. The Fiscal Year 2002 Transportation Appropriations Act included funding for a feasibility study for extending Interstate 85 west from Montgomery, Alabama to Interstate 20 and Interstate 59 near Meridian, Mississippi. During the fall of 2002, then-Governor Don Siegalman of Alabama brought up the Interstate 85 extension as well as reinforcing the desire for a Black Belt freeway corridor in Western Alabama between Mobile and Florence. Funding for these projects was generally for preliminary planning, design and engineering, and additional funds were allocated to this project in 2005. 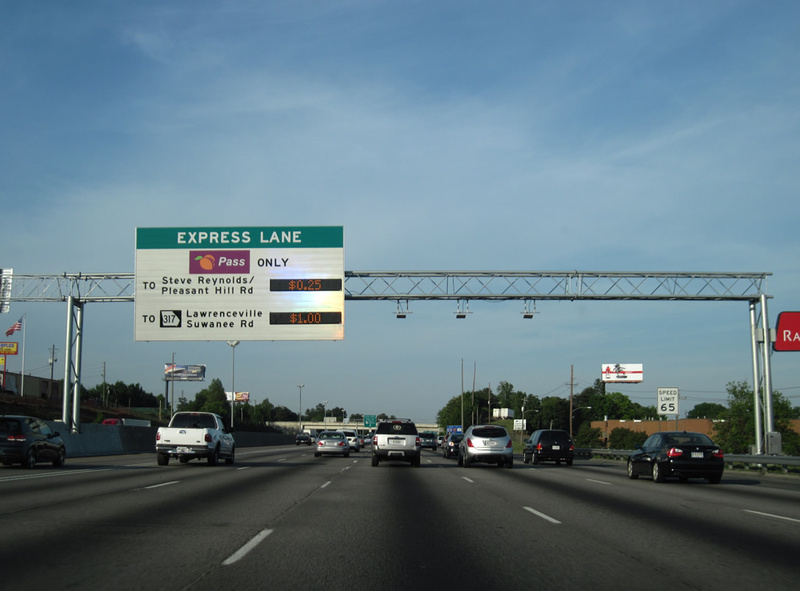 The Safe, Accountable, Flexible, and Efficient Transportation Equity Act: A Legacy for Users (SAFETEA-LU) (enacted into law on August 10, 2005) appropriated $100 million toward the Interstate 85 Extension Project. 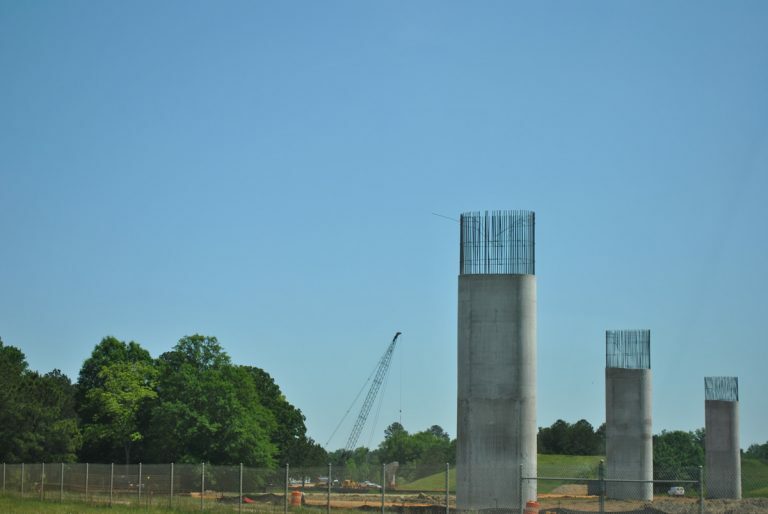 Construction of pier supports for the I-85 northbound ramp to Alabama 108 as they pass above Alabama 126 (former U.S. 80). Photo taken April 13, 2012. Ultimate plans for the Montgomery Outer Loop call for Interstate 85 to be relocated from its present alignment west to I-65 near Downtown onto the southerly bypass. When completed, the existing I-85 will be redesignated as Interstate 685. AASHTO approved the I-685 designation pending FHWA approval on October 30, 2010. Those portions of proposed Interstate 85 that overlay U.S. 80 west of Montgomery is apart of High Priority Corridor 6: U.S. 80 from Meridian to Macon. 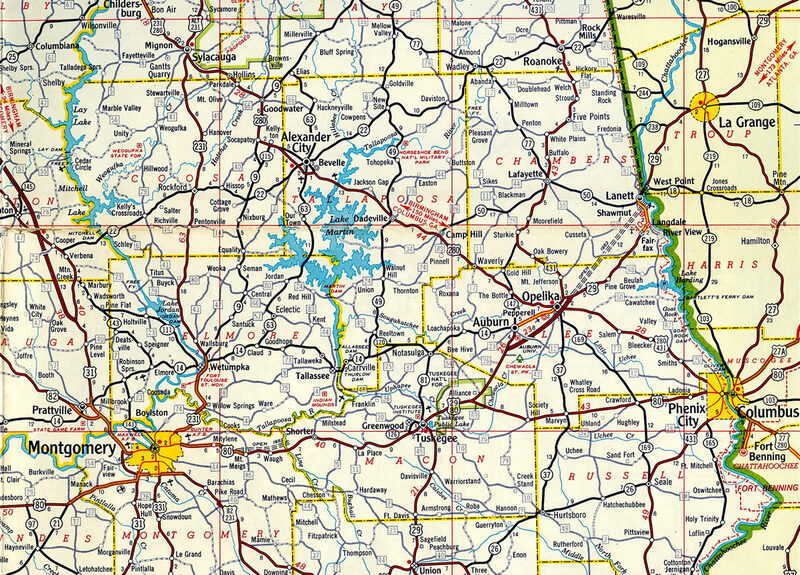 Interstate 85 largely follows or overlaps with U.S. 80 from Montgomery east to Tuskegee. U.S. 29 joins the corridor from Tuskegee, Alabama northeast to Atlanta, Greenville, Charlotte and Greensboro. 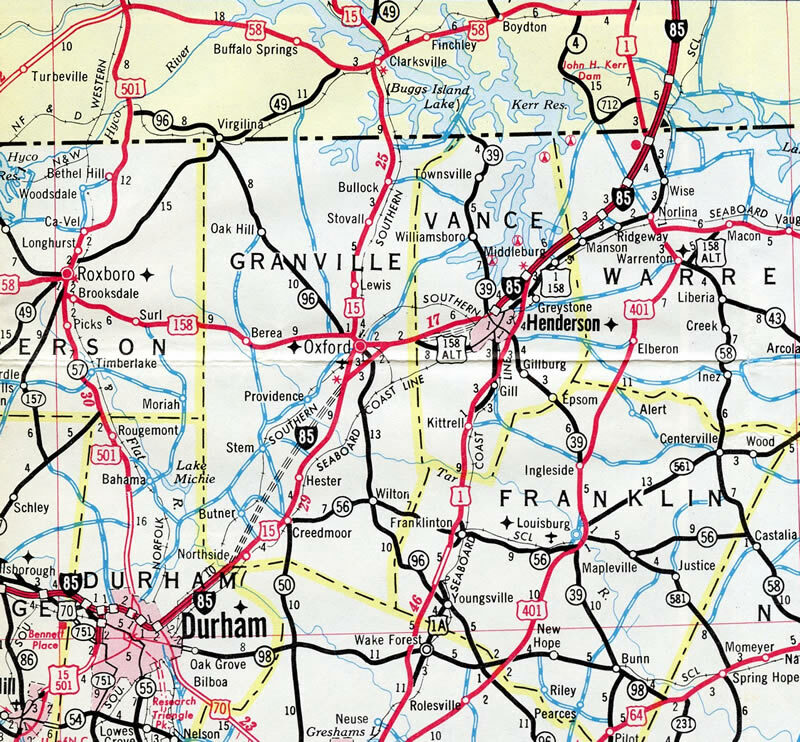 U.S. 70 ties into the corridor from Greensboro east to Durham. U.S. 15 accompanies I-85 from Durham north to Oxford, handing off to U.S. 1 for the remainder of the journey northeast to Petersburg, Virginia. 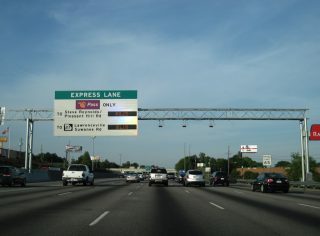 Dynamic message sign displaying the rates for the High Occupancy Toll (HOT) lanes in use along Interstate 85 northeast of Atlanta. Photo taken 04/13/12. The HO/T lanes of I-85 in Georgia became operational on October 1, 2011 from Interstate 285 to Old Peachtree Road. Usage of the lanes requires an account with PeachPass. 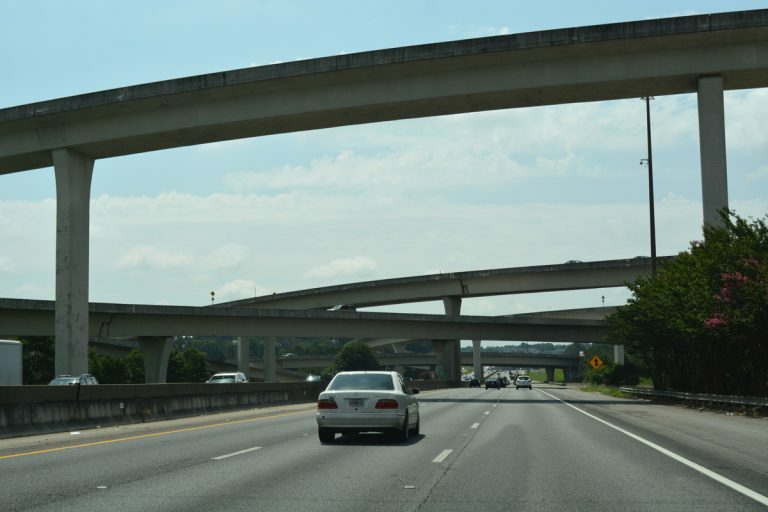 The Auburn-Opelika bypass was the first section of I-85 completed in Alabama. The freeway was extended north from there to Lanett in 1962 and also built between Mt. Meigs and Waugh the same year. Interstate 85 was completed from College Park north through Atlanta to Suwanee in 1964. Construction was underway along the remainder through northeast Georgia and southward to the Coweta County line. 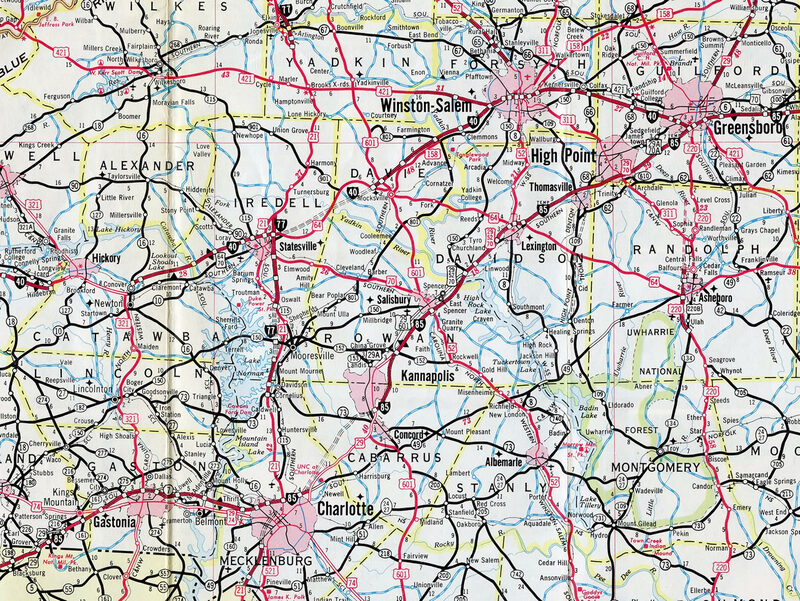 Interstate 85 projected along the "upper route" through northeast Georgia in 1960. 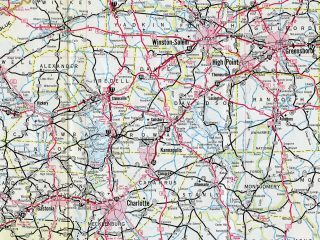 Construction eventually opened 67 miles of Interstate 85 between Suwanee and the South Carolina state line on November 5, 1965. This was the first Interstate segment to link Atlanta with an adjoining state. Associated work built the I-85 Connector, which opened in October 1969 as Georgia 365.15 This was redesignated as Interstate 985 in 1984. The 1.6-mile overlap between Interstates 85 & 285 by Hartsfield-Jackson International Airport (ATL) was reconstructed to split each route into separate roadways with 16 overall lanes. Eight lane expansion of I-85 between Peachtree City and the southwest junction with I-285, a distance of 16.2 miles. Upgrading the cloverleaf interchange with Interstate 285 to the northeast of Atlanta into the multi-level Tom Moreland Interchange, locally known as "Spaghetti Junction". Rebuilding the Downtown Connector with I-75 to widen the freeway and reconfigure the Capitol Hill Interchange with I-20. Interstate 285 curves southeast from Doraville through "Spaghetti Junction" with Interstate 85. Photo taken July 2, 2017. Construction finally broke ground on the new northern alignment for Interstate 85 in April 1988. 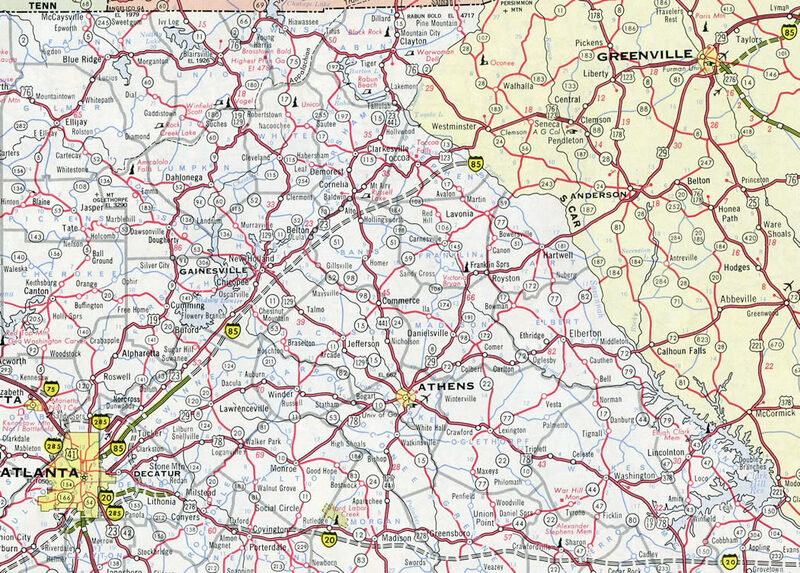 Discussion however continued involving the number of the old route toward Spartanburg, with the state Highway Department formally requesting the designation of Interstate 285 in a February 5 letter to the Federal Highway Department.22 Section 139 of the Surface Transportation Assistance Act of 1982 specified that Interstate construction funds were made available on a costs to complete basis. Since I-85 was deemed woefully substandard by Spartanburg, it was considered incomplete. Section 139 called for relocation of an Interstate, and so the I-85 designation was reassigned to the new bypass, enabling 90% in federal funding.23 Proposals for I-285 were ultimately dropped and the route of I-585 unchanged. 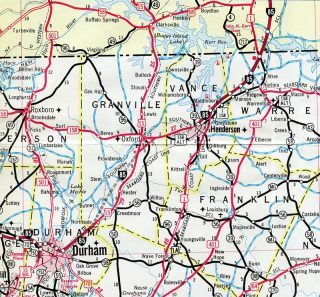 Interstate 85 widens to eight lanes where it overlaps with Interstate 40 between Greensboro and Durham in North Carolina. A realignment of I-85 to bypass Greensboro shifted the freeway from a shared alignment with I-40 through Greensboro to a February 22, 2004 opened4 route to the south and east of the city. The new freeway varies between six and eight lanes from near milepost 120 of the original I-85 to the east end of the Interstate 840 interchange. The highway was constructed as part of the overall planned Greensboro Beltway, a circumferential highway looping south from Joseph M. Bryan Boulevard near Piedmont Triad International Airport (PTI) to Painter Boulevard (I-73) and east to Interstate 785 & 840 at U.S. 70 (Burlington Road). AASHTO approved of the I-85 relocation on May 14, 2004. Three lanes of Interstate 85 turn east onto the bypass of Greensboro while three lanes wind northward onto Business Loop I-85 toward Downtown. A directional ramp follows onto Interstate 73 north to the airport and I-40 west. Photo taken June 1, 2012. The $160 million3 relocation of Interstate 85 was developed as a solution for the overwhelming and often congested "Death Valley" interchange where Interstates 40 and 85 previously came together. The nickname stemmed from a history of fatal accidents associated with the interchange. The wye interchange included a left-hand ramp for I-85 south, narrowing travel lanes and a weaving traffic pattern with the adjacent Randleman Road exit. NCDOT estimated 120,000 vehicles per day (vpd) traveled through Death Valley until the new bypass opened. Old Interstate 85 through Greensboro was redesignated as an extension of Business Loop I-85 north from High Point. Exit numbers along the former I-85 were renumbered to reflect the business loop mile markers northward from Lexington. The portion east from Death Valley doubles as both Interstate 40 and Business Loop Interstate 85 to the merge with I-85 north. Original plans shifted Interstate 40 onto the southern portion of the beltway upon its completion. This occurred when the southwestern beltway opened on February 21, 2008 and lasted for a period of seven months, before NCDOT shifted I-40 back to its in-city routing. Interstate 73 and a relocated U.S. 421 follow the southwestern beltway (Painter Boulevard) from I-85 north to I-40 today. Broad Street west to U.S. 15-501 by Winter 2007. Other portions of Interstate 85 in North Carolina underwent modernization and expansion as part of the I-85 Corridor Improvement Project. $201.5-million in road work focused on I-85 through Davidson and Rowan Counties between October 2010 and May 2013. This project followed widening of 8.3-miles of freeway between the U.S. 29 / NC 49 Connector (Exit 42) and Concord Mills Boulevard (Exit 49). That construction increased I-85 to eight overall lanes with a 22 foot median between Exit 42 and I-485, and seven lanes between I-485 and Exit 49. A left-hand on-ramp from the U.S. 29 / NC 49 connector was relocated to merge on the right as well. Construction was underway between December 2, 2002 and May 27, 2005. Further north, the structurally deficient crossing of the Yadkin River was replaced as part of the I-85 Corridor Improvement Project. Work broke ground September 29, 2010 on a $136-million job to realign I-85 onto a new set of bridges east of the original Yadkin River spans. Widening to eight lanes of 3.5 miles of freeway was included in the work, which also reconfigured the two wye interchanges with U.S. 29 & 70 and NC 150 to separate local traffic movements from I-85 with a new service road and six-ramp parclo interchange. The new northbound bridge opened in May 2012, followed by completion of the southbound bridge in March 2013. Traveling on Interstate 85 & U.S. 460 east, the first mention of Interstate 95 is at this roadside sign, 1.75 miles west of their trumpet interchange. Photo taken 06/01/12. U.S. 460 briefly joins Interstate 95 south from Exit 68 to County Drive for its trek east to Norfolk and Hampton Roads. Photo taken 06/01/12. The final three exits on northbound Interstate 85 are as follows: Exit 68 for I-95 south & U.S. 460 east to U.S. 301; Exit 69 for the I-95 c/d roadway to Wythe and Washington Streets and Downtown Petersburg; and the direct transition onto northbound I-95. Photo taken 06/01/12. Exit 68 leaves Interstate 85 north for Interstate 95 south & U.S. 460 east. This movement is required to make the connection with Interstate 295 around both Petersburg and Richmond. I-295 carries significantly less traffic than the Richmond-Petersburg Turnpike and sees sections with a 70 mile per hour speed limit. Photo taken 06/01/12. Photos showing all signs related to Exit 68 and some replaced signs as well, posted at the Interstate 85 north – Virginia highway guide. Removed by 2012, an end sign was posted at the I-95 mainline overpass, just before the departure of Exit 69 to U.S. 460 Business & Virginia 36 (Wythe / Washington Streets). Interstate 95 enters the capital city of Richmond in 18 miles. This connection was originally part of the tolled Richmond-Petersburg Turnpike. The turnpike began along Interstate 85 at U.S. 1 (Exit 63) and continued northward to the I-64 / I-95 overlap through central Richmond. Photo taken by Carter Buchanan (08/08/04). The first advance sign of Interstate 85 (Exit 51), replaced by 2015, preceded Exit 54 to Virginia 144 (Temple Avenue) in Colonial Heights. Photo taken 07/09/10. Interstate 95 spans the Appomattox River into the city of Petersburg on the approach to I-85 and U.S. 460. The two-mile sign for I-85 south was replaced by 2015 to use Clearview font. Photo taken by Carter Buchanan (07/01/05). The split between Interstate 95 and Interstate 85 is a major division between two southerly routes: I-95 follows the Atlantic Coastal Plain through the Carolinas and Georgia into Florida, while I-85 angles southwesterly toward the Appalachian Piedmont en route to Durham, Charlotte, Atlanta and Montgomery. Photo taken 07/09/10. Interstate 95 south passes just east of Downtown Petersburg at the back to back ramps for Wythe and Washington Streets (U.S. 460 Business & Virginia 36). The mainline will split from the Richmond-Petersburg Turnpike in one mile at Exit 51. U.S. 460 bypasses Petersburg along I-85 south to Exit 61. Photo taken 01/01/17. U.S. 460 east merges onto Interstate 95 south from the ending Interstate 85 north. U.S. 460 combines with I-95 briefly before resuming an eastward course to Norfolk, Virginia Beach, and Hampton Roads at the following interchange (Exit 50). Photo taken Photo taken 01/01/17. Arrow per lane (APL) signs for Exit 51 were installed along Interstate 95 south at the partition with I-85 (Richmond-Petersburg Turnpike) in 2015. I-85 turns west to U.S. 1 and the split with U.S. 460. The freeway travels a rural course southwest from Petersburg to Durham, North Carolina. Photo taken Photo taken 01/01/17. Popular in the road enthusiast community, and perhaps with general motorists alike, a pair of sign bridges once referenced both Miami and Atlanta for the I-85/95 southbound split in Petersburg. APL signs displaying just Rocky Mount for I-95 and Durham for I-85 replaced both sets in 2015. Photo taken 07/09/10. Interstate 95 southbound at the St. Andrew Street underpass and departure of Exit 51. Expansion of the ramp for I-85 to two lanes in July 2014 led to the replacement of these signs for Miami and Atlanta. Photo taken Photo taken 07/09/10. A diagrammatic sign outlined the upcoming split of Interstate 95 from the tolled Richmond-Petersburg Turnpike. The toll road extended another three miles west at the time along I-85 south. Because of the turnpike, U.S. 460 remained on its surface route due to the restriction on tolled US Routes. Photo taken by Michael Summa (1976). The first sign of Interstate 85 posted along Interstate 95 north appears 2.25 miles out from the trumpet interchange at Exit 51. U.S. 460 joins the I-95 freeway at Exit 50A for a short overlap to I-85 south. Photo taken by Will Weaver (05/08/10). A collector distributor roadway departs for Exits 50A-D, facilitating travel to U.S. 460 east, U.S. 301 (South Crater Road), and Downtown Petersburg. Mainline traffic continues unimpeded to Exit 51 for Interstate 85 south & U.S. 460 west. Photo taken 06/25/10. Traffic along the Exit 50 c/d roadway splits with a slip ramp for the I-95 mainline to Interstate 85 south (Exit 51) and a sweeping ramp circumnavigating the trumpet interchange to for Wythe and Washington Streets (U.S. 460 Business & Virginia 36). A brief weaving traffic pattern ensues at Exit 51 between entering and exiting traffic on I-95. Photo taken 06/25/10. U.S. 460 joins the I-95 mainline just ahead of the loop ramp (Exit 51) onto Interstate 85 south. U.S. 460 and Interstate 85 overlap for seven miles before splitting westward to Blackstone. Photo taken by Will Weaver (05/08/10). Exit 51 leaves Interstate 95 north for Interstate 85 south & U.S. 460 west. Located where I-85 meets U.S. 58, South Hill is the main control city in Virginia. Durham is the destination otherwise, 130 miles to the southwest. Photo taken by Will Weaver (05/08/10). The first overhead of the impending junction with Interstate 65 on Interstate 85 southbound. The last Downtown Montgomery interchange departs for Union Street (former U.S. 331) in 0.75 miles. Photo taken 12/31/12. Interstate 85 southbound at Exit 1 (Union Street). This exit serves the Alabama State Capitol and Perry Street. I-85 is now within 1.25 miles of Interstate 65. The interchange is full access with I-65, even though the right-hand panel displays “TO Interstate 65 North”. Photo taken 01/21/13. Interstate 85 ascends towards the end with Interstate 65. An access ramp continues westward to Day Street at the terminus as well. Photo taken 01/21/13. Two lanes are allocated for both directions of Interstate 65 from Interstate 85 southbound. This slotted overhead shows the lane distribution for I-65 and the Day Street connector. Photo taken 12/31/12. An Interstate 85 end shield stands at the entrance to the terminus interchange with Interstate 65. A sign project during 1995-96 replaced a state-named version of this shield. Photo taken 01/21/13. The ramp to I-65 southbound curves sharply and immediately lowers to merge onto I-85 at a lane drop. Traffic also descends to street level along the Day Street off-ramp. Day Street stems west to Birmingham Highway (former U.S. 31 & 80) and Maxwell Air Force Base. Photo taken 01/21/13. Traffic entering Interstate 65 north sees this sign bridge for the pending merge onto the mainline and the subsequent split-diamond interchange with Herron Street (Exit 172) to the central business district and Maxwell A.F.B. Photo taken 08/22/03. The mainline of Interstate 85 defaults onto Interstate 65 southbound at a three level interchange. A mostly rural, nondescript 163-mile journey awaits those traveling south along I-65 to the city limits of Mobile. Photo taken 01/21/13. Two miles south of the Interstates 65 and 85 northbound split (Exit 171). 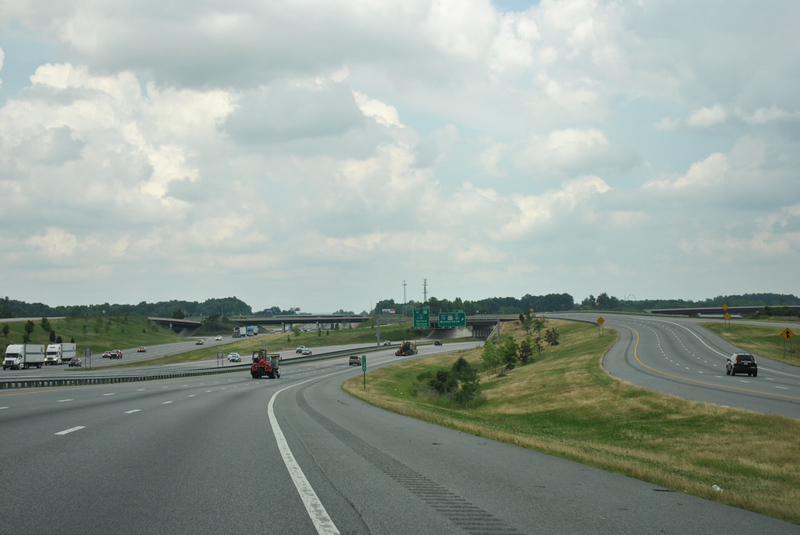 Interstate 65 was expanded to six overall through lanes at Montgomery as part of a $110-million overhaul of the freeway between 2006 and December 21, 2010. Photo taken 04/13/12. Exit 170 to Fairview Avenue, a former alignment of U.S. 80, departs Interstate 65 north, one mile south of the directional cloverleaf interchange with Interstate 85 (Exit 171). Photo taken 01/19/13. A large diagrammatic overhead precedes the Early Street overpass along Interstate 65 north for Exit 171 and Interstate 85 north. Two lanes serve movements to Atlanta while I-65 now carries three lanes to Prattville. Photo taken 01/19/13. Exit 171 departs Interstate 65 north for Interstate 85 north. Interstate 85 initially heads east through Montgomery before turning more northward from near Tuskegee to Auburn, Opelika and Atlanta. Photo taken 11/03/11. For historical photos from this perspective, including photos of button copy signage, see the guide for Interstate 65 North – Lowndes, Montgomery & Elmore Counties. The first indication of Interstate 85 north (Exit 173) along Interstate 65 south appears two miles north of the terminus. I-65 follows a causeway between a bend along the Alabama River to a trumpet interchange (Exit 173) with North Boulevard (Alabama 152). Photo taken 10/09/16. $110-million in improvements were undertaken along Interstate 65 between Exits 173 and 168 through Montgomery between 2006 and December 21, 2010. This resulted in added lanes, expanded bridges and sign replacements throughout the stretch. 2011 sign additions for Interstate 85 north included those on this sign bridge, one mile to the north. Photo taken 10/09/16. Exit 172 departs Interstate 65 south, one half mile north of the directional cloverleaf interchange with Interstate 85. A split-diamond interchange connects with Clay and Herron Streets to the central business district and state capitol complex. Photo taken 10/09/16. Aforementioned road work expanded Interstate 65 south to four lanes through Exit 172 and the northbound beginning of Interstate 85 (Exit 171). Atlanta, Georgia is a 155-mile drive via I-85 north. Photo taken 10/09/16. The Herron Street on-ramp joins Interstate 65 south to form an auxiliary lane to I-85 north and the Day Street Connector (Exit 171). I-65 south continues with three overall lanes. Photo taken 10/09/16. Three lanes leave Interstate 65 south for Interstate 85 north and the Day Street Connector. The ramp for I-85 dives below the three-level interchange along a sharp curve with an advisory speed of 35 miles per hour. Motorists taking the Day Street ramp continue westward to Maxwell Air Force Base and Birmingham Highway (former U.S. 31 and 80). Photo taken 10/09/16. A conventional guide sign takes the place of a gore point sign for the Interstate 85 northbound beginning. The freeway travels below grade and bisects the Montgomery street grid between Downtown and the Garden District over the next two miles. Photo taken 10/09/16. 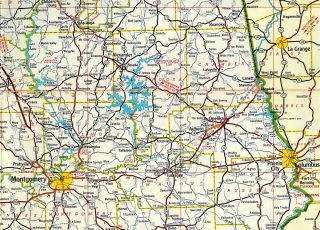 For historical photos from this perspective, see the guide for Interstate 65 South – Montgomery & Lowndes Counties. The Day Street connector ramps to Interstate 65 and Interstate 85 north begin at the signalized intersection of Day and Hill Streets. Photo taken by Chris Patriarca (02/15/03). The Day Street connector partitions into ramps for Interstate 65 north and 85 north. There is no access to I-65 south. Photo taken by Chris Patriarca (02/15/03). Interstate 65 and 85 shield assembly at the gore point and end of the Day Street connector. I-65 north reaches the city limits of Birmingham in 86 miles while I-85 travels ten miles within the Montgomery city limits. Photo taken by Chris Patriarca (02/15/03). “I-85 to be 12 lanes near Northgate.” The Herald Sun, September 4, 2003. I-85 Widening (Anderson County) http://www.dot.state.sc.us/Projects/I-85/default.html, SCDOT project web site. “Drivers race to road around &apos;Death Valley&apos;.” Charlotte Observer, February 23, 2004. Aaron Porter, email: “New Section of I-85 Open” February 21, 2004. Jeff Absher, email: “Re: I-85,” May 25, 2004. “Overbudgeted I-85 Project Officially Opens.” WRAL, February 12, 2008. “Nation’s Top Highway Official Helps Break Ground on Montgomery Outer Loop.” FHWA Press Release, September 28, 2011. “Montgomery Outer Loop Project update.” WSFA, October 25, 2012. "Long-awaited section makes drivers happy." Herald-Journal (Spartanburg, SC), September 1, 1995. “Light at end of the tunnel for Interstate 85 construction.” The Atlanta Journal and The Atlanta Constitution, September 17, 1987. "Completion near for interstate road systems," Rome News-Tribune, November 14, 1977. "Interstate 85 through Hall? It very nearly was Gov. Ernest Vandiver redirected highway plans in 1950s." The Times (Gainesville, GA), April 13, 2005. "Nation&apos;s Longest Interstate Route." Herald-Journal (Spartanburg, SC), Novermber 11, 1959. "I-85, N.C. To Ga. To Open In August." Star-News (Wilmington, NC), August 3, 1964. "I-85 Improvement Plan – Construction May Begin Sometime This Year." Herald-Journal (Spartanburg, SC), January 13, 1983. "Controversy On Interstate 85." Herald-Journal (Spartanburg, SC), August 7, 1983. "City Council Given Options On Road Improvements." Herald-Journal (Spartanburg, SC), October 4, 1983. "Officials Concerned About Accessiblity To Re-Routed I-85." Herald-Journal (Spartanburg, SC), December 15, 1983. "State, feds at odds over I-85 name." Herald-Journal (Spartanburg, SC), May 4, 1988. I-85 The Boom Belt, South Carolina, FHWA web site. "New I-85 expected to open later this year." Herald-Journal (Spartanburg, SC), July 27, 1994. "Rain delays grand opening of I-85 bypass until spring." Herald-Journal (Spartanburg, SC), December 26, 1994. "State opens 19 more miles of Interstate." Star-News (Wilmington, NC), September 2, 1971. "State Approves Final Interstate 85 Contract." The Dispatch (Lexington, NC), May 15, 1982. "Road proposal &apos;innovative" but expensive." Herald-Journal (Spartanburg, SC), April 16, 2000. "I-85 collapses after massive fire: &apos;The entire bridge is compromised&apos;." The Atlanta Journal-Constitution, March 31, 2017. "I-85 BRIDGE COLLAPSE: Both directions to be closed as crews work to make repairs." WSB-TV 2 (Atlanta, GA), March 31, 2017. "Cleanup continues on I-85, DOT aims to reopen Piedmont Rd. by Tuesday." Fox 5 Atlanta, April 3, 2017. "Final Countdown: Crews begin striping lanes of I-85." WSB-TV 2 (Atlanta, GA), May 9, 2017. Page updated July 3, 2017.